One of the most successful British imports to the States, Upstairs, Downstairs won 7 Emmys(r), a Golden Globe, and a Peabody. Seen on Masterpiece Theatre and A&E, it follows the aristocratic Bellamys and their servants through 30 years of life in a fashionable London townhouse. 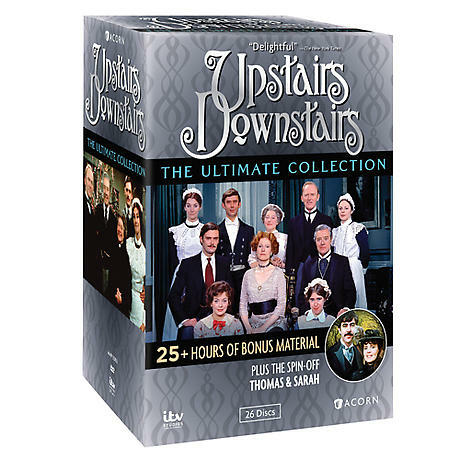 Ultimate collection also includes Thomas & Sarah, the continuing saga of the wily chauffeur (John Alderton, Little Dorrit) and the sassy Cockney parlor maid (Oscar(r) nominee Pauline Collins). Two complete series, 81 episodes, 68 hrs. 25 DVDs, SDH.